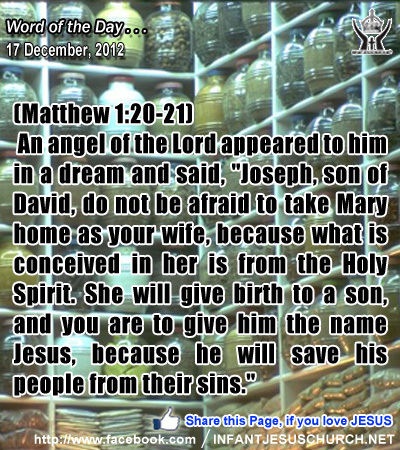 Matthew 1:20-21: An angel of the Lord appeared to him in a dream and said, "Joseph, son of David, do not be afraid to take Mary home as your wife, because what is conceived in her is from the Holy Spirit. She will give birth to a son, and you are to give him the name Jesus, because he will save his people from their sins." Heavenly Father, thank you for bearing the cost of our sin in Jesus. Thank you precious Lord for taking on human flesh and bearing it's difficulties and facing rejection so we could be saved. Our salvation makes all other names pale in comparison to Jesus, in whom we offer all thanks and praise. Amen. 1The book of the genealogy of Jesus Christ, the son of David, the son of Abraham. 2Abraham was the father of Isaac, and Isaac the father of Jacob, and Jacob the father of Judah and his brothers, 3and Judah the father of Perez and Zerah by Tamar, and Perez the father of Hezron, and Hezron the father of Ram, 4and Ram the father of Ammin'adab, and Ammin'adab the father of Nahshon, and Nahshon the father of Salmon, 5and Salmon the father of Bo'az by Rahab, and Bo'az the father of Obed by Ruth, and Obed the father of Jesse, 6and Jesse the father of David the king. And David was the father of Solomon by the wife of Uri'ah, 7and Solomon the father of Rehobo'am, and Rehobo'am the father of Abi'jah, and Abi'jah the father of Asa, 8and Asa the father of Jehosh'aphat, and Jehosh'aphat the father of Joram, and Joram the father of Uzzi'ah, 9and Uzzi'ah the father of Jotham, and Jotham the father of Ahaz, and Ahaz the father of Hezeki'ah, 10and Hezeki'ah the father of Manas'seh, and Manas'seh the father of Amos, and Amos the father of Josi'ah, 11and Josi'ah the father of Jechoniah and his brothers, at the time of the deportation to Babylon. 12And after the deportation to Babylon: Jechoni'ah was the father of She-al'ti-el, and She-al'ti-el the father of Zerub'babel, 13and Zerub'babel the father of Abi'ud, and Abi'ud the father of Eli'akim, and Eli'akim the father of Azor, 14and Azor the father of Zadok, and Zadok the father of Achim, and Achim the father of Eli'ud, 15and Eli'ud the father of Elea'zar, and Elea'zar the father of Matthan, and Matthan the father of Jacob, 16and Jacob the father of Joseph the husband of Mary, of whom Jesus was born, who is called Christ. 17So all the generations from Abraham to David were fourteen generations, and from David to the deportation to Babylon fourteen generations, and from the deportation to Babylon to the Christ fourteen generations. When Jacob blessed his sons he foretold that Judah would receive the assurance of royalty which we see satisfied in David. We can also see in this blessing a revelation of God's fulfillment in raising up his anointed King, Jesus the Messiah. Jesus is the completion of all God's promises. He is the anticipation not only for the people of the Old Covenant but for all nations as well. He is the Savior of the world who save us from slavery to sin and Satan and makes us citizens of the kingdom of God. In him we receive acceptance into a royal priesthood and holy nation as sons and daughters of the living God. Do we recognize your spiritual genealogy and do we accept God as our Father and Jesus as the sovereign King and Lord of our life? Loving Infant Jesus, you are the Messiah and redeemer of the world, the hope of Israel and the hope of the nations. Be the ruler of our heart and the king of our home. May there be nothing in our life that is not under your wise rule and care.